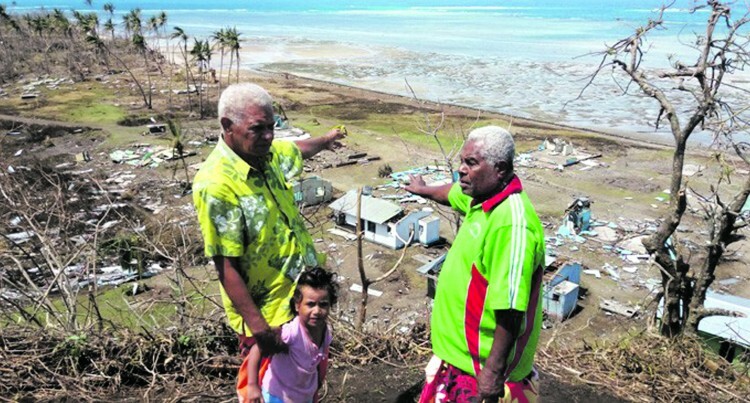 Villagers survey the aftermath of Severe Tropical Cyclone Winston on Nasau, Koro Island, in 2016. Thousands of people living in Koro Island are rejoicing after the recon­struction of Koro Island Road, suc­cessfully completed by the Fiji Roads Au­thority (FRA). Nabasovi Village spokesman Mikaele Ma­tata says the new road has improved their lives significantly. FRA chief executive officer Jonathan Moore says these efforts were better appre­ciated when considered against the back­drop of what existed before. Koro was one of the islands worst hit by Tropical Cyclone Winston. “The 16-km road will improve the quality of life of the rural population through the provision of basic weather road access to all the villages in a cost-effective manner and to promote economic growth by reduc­ing rural transport costs,” Mr Moore said. He said the project scope was completed last year, but they had carried out addi­tional repair works because of the impact of TC Winston in 2016. This included the construction of new drainage, shaping of existing pavement and the construction of pavement. This project was under the Eastern Island Roads Upgrade project for maintenance and renewals of the existing roading network, and bridge repairs superstructure replace­ment for Moala, Vanuabalavu, Lakeba and now Koro Island.